This sweater, which I have embarked upon against all good sense, is starting to follow the child’s story of Goldilocks and the Three Bears. Of the story, I remember three bowls of porridge, one too hot, one too cold and one just right. I don’t remember if Goldilocks gets eaten in the end by the bears, but I do remember she was clearly trespassing on their territory. I also remember the growing sense of dread I experienced while being read the story. That growing sense of dread is happening again. Yesterday I was decreasing for armholes, today I am back to the first 5 inches (13)cm of the sweater. Yep, ripped it right back after I discovered I’d been working the lace panel wrong. How could I knit almost 13 inches (33) cm without noticing the mistake? In my house it’s easy. The lace is a 16 st and 16 row pattern. Every time I got to row 11 some disaster would occur: Yarn Rascal, The Skipper, my mother, Yarn Rascal, Yarn Rascal, The Skipper. I’d hurriedly put down the knitting, deal with the disaster and go back to knitting not remembering where I was. I’d look at the chart, I’d look at my knitting, match up both and figure I was a row further than I really was. Yesterday, for the first time, I was able to carve a chunk of uninterrupted moments to knit and that’s when I realized my mistake. I was finally able to work through the 16 rows without being disturbed and what the needles created was quite different from what I’d seen up to then. There was nothing else to do but rip back to the start of the lace panel. While ripping I calmed myself with the thought that I wasn’t completely sure about the armhole anyway. I was dithering between making it 8 or 8.5 inches (20.5 or 21.5) cm. Since my mastectomy, I get lymphedema that comes and goes. It increases the size of my arm at the precise area where the armhole occurs. I don’t want a tight-fitting armhole. On the other hand, I don’t want one that’s too big for when I don’t have the lymphedema. I want one that’s just right. So I am in a bit of a Goldilocks dilemma…You know, I really do think the bears got her at the end. Didn’t they? One year ago today I was in the operating room having my mastectomy. Sleet fell the entire day, covering everything in ice. Today the sun is out and the Polar Vortex is back with its biting temperatures. Today I am knee-deep into a test knit of a Spring sweater and that is what I want to talk about. Admittedly, I don’t often knit sweaters for me because of the Sweater Curse, but the times I do decided to try to get past the Curse I always approach the selected pattern the same way,with dread by reading through the entire thing before I select a size. Selecting an appropriate size, they say, depends on bust size. It’s as if they think bust size is some magical number that automatically makes numbers for waist, armhole depth, cross back, sleeve length, neck width, and the length of the garment all fall into place for a nice fit. It doesn’t happen that way. In choosing a size I also need to consider how the garment is supposed to fit and how that differs from the way I want it to fit. So I scanned the bust sizes and giggled. For my breast prosthesis I was fitted by an expert so I knew my size, but for the sheer amusement of it, I measured anyway. It’s exactly the same we fitted the prosthesis for, 40 inches. 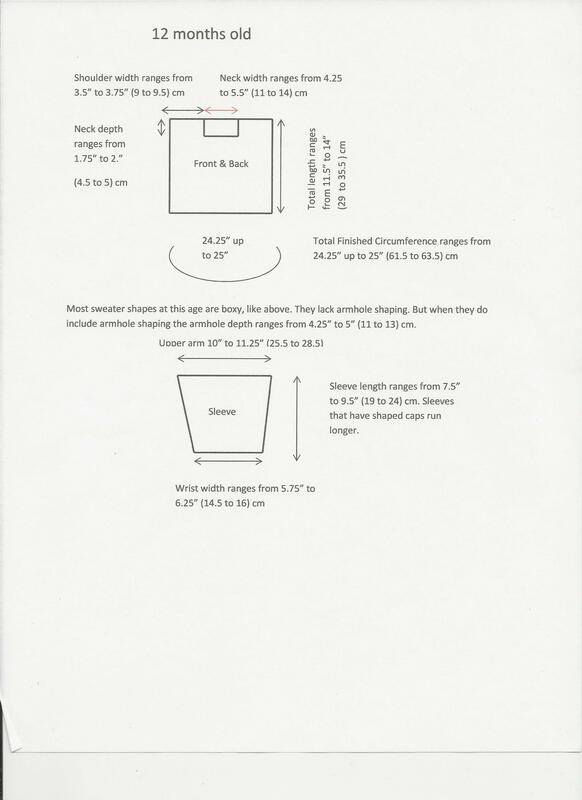 Then I scanned the pattern to see if the designer included the measurement for ease. She’s a good designer so she had. The ease was two inches. That means the sweater circumference at the bust line is 42 inches (107) cm. The industry considers an ease of 1 to 2 inches (2.5 to 5 )cm close-fitting. On the other hand, it calls the ease of 2 to 4 inches (5 to 10) cm roomy. So 2 inches is both a close fit and roomy. I pondered this for a minute. I didn’t want a close fit nor an overly roomy fit. I decided that since 2 inches fell into both categories it probably meant it was not too close, not too roomy, but just the right fit. Or something along the lines of the story about The Three Bears. I am going with the size 40 sweater. Time to get the paper, pencil and calculator. Yes, if I want a sweater that fits me and my proportions, I need to work for it. The first set of numbers I write down at the top of the paper is gauge: 5 sts and 6.5 rows = 1″ (2.5) cm. The next numbers I need to know are the total length for the size I’ve chosen, the number of stitches cast on, the number of stitches increased or decreased for any waist shaping (a little giggle here too, what waist? ), the number of stitches worked for the long haul up to the bust. This last number should be 21 inches (53.5) cm for the back. I got 21 by dividing the total circumference by 2. 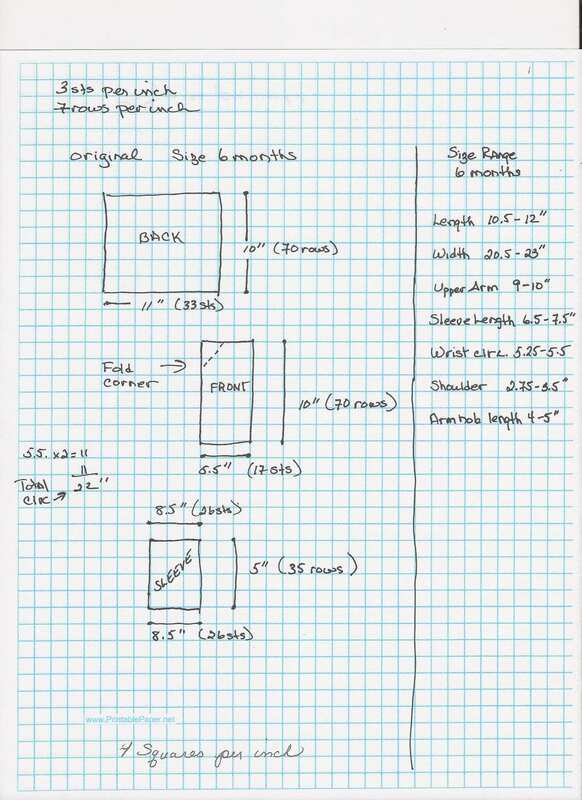 I look at the schematic to find the length for my size is 22.25″ (57) cm. My favorite shirt that fits me perfectly is 23 inches (58.5) cm long. I consider this. 23 is my ideal length. Looking through the pattern I see it is knit in stockinette stitch and lace panels, both of which tend to grow in length and width. I decide to stay with the pattern length. Next up, check the bust measurement to see that the stitches I need to work equals half the total circumference of the sweater. A small snafu, naturally. The cast on uses a smaller size needle than the needle size I used to get gauge. Do I really want to do the math to find the gauge and then more math to find the width of the cast on? No. So I read further hoping the pattern will solve this problem for me and it does. I need to change back to the needles I used for gauge, knit a little, then waist shaping occurs. At the end of this shaping I have 104 sts. 104 divided by my gauge of 5 = 21 inches (53.5) cm. Since I have the right amount of stitches needed after waist shaping I decided to not do the math to figure out the exact circumference of the cast on for the peplum. Next up, rows and length, armholes and cross back measurements and why I don’t weave in ends until I am all finished. Here is the schematic of the original 6 month old pattern I created from the information given in the pattern. All you need to know is gauge, the number of stitches cast on, decreased and remaining to find the width of the piece at any given point. To find the length, pay attention to the measurements given. These are usually given as “work until piece measures x.” The other way to find the length is to add up the rows. For example, to find neck depth count the number of rows worked from the start of neck shaping to the bind off on the front piece. If 7 rows equals an inch and you work 14 rows from beginning of neck shaping to bind off the neck depth is 14 divided by 7 = 2 inches. Want to find the total circumference of the sweater? For a cardigan add the two front widths and back widths. For a pullover add the front and back widths. One caution here. Use the number of stitches and the width they give to determine the “unfinished” circumference. Seaming sides causes the circumference to lose about 1/4 inch each side. To find the finished circumference subtract a 1/2 inch from the unfinished circumference number. 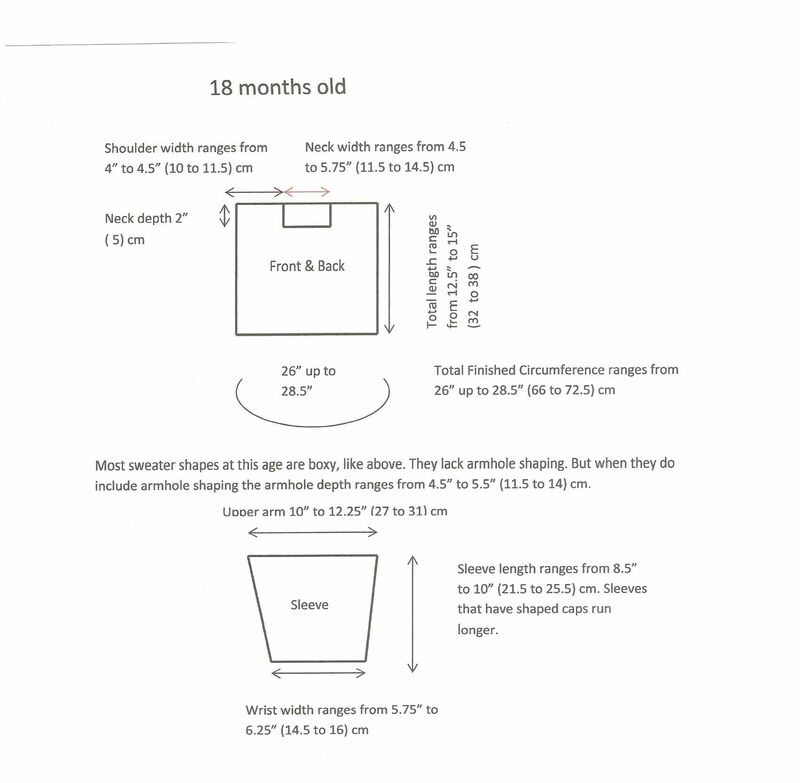 Schematics are not always clear as to whether they represent the unfinished or finished dimensions. The original 6 month old sweater pretty much falls within the size range for a 6 month old. The overall length is a little short. I would add an inch to bring it to 11 inches. Babies outgrow sweaters lengthwise quicker than they out grow them width-wise. The other area of concern is the sleeve. The sleeve length is 5 inches, 1.5 inches shorter than the lower end of a 6 month size range. The upper arm of the sleeve is 1/2 inch smaller, while the wrist is 3.25 inches larger than average. When the discrepancy is this large, study the picture of the garment. Often the numbers reflect design decisions. In this case, the sleeve is intentionally designed shorter and wider at the lower arm. Altering it there would throw off the balance of the design. I would let it remain as is. However, I would add the 1/2 inch to the upper arm width. The armhole length is created by the width of the upper part of the sleeve. I would add the 1/2 inch to accommodate clothing worn under the sweater. Altering the sweater to fit a 3 month old size is a matter of changing the numbers if you want to keep all the design elements and ratios of the original, including the gauge. I have certain things that drive me around a bend when it comes to baby sweater designs. Necklines and collars are two. In my alteration, which I will post on Wednesday, I alter the design of the neckline as well as armholes. In other news, I am waiting for my latest order from Jamieson and Smith of cobweb lace yarn to arrive. The Shetland Baby blanket moves a step closer to being started for real rather than just swatched. I have doubts about my sanity in beginning this project. Knitting Shetland lace motifs across 60 stitches and getting it right was not always successful for me. What happens when its 250 stitches or 700? A mistake has epic consequences at that stitch count. So far I have not been successful in neatly un-knitting to reach a mistake and then fixing it. No, I’ve had to resort to unraveling the entire swatch in order to avoid weeping and wailing. I find contentment in the fact that I only ordered half the amount of yarn I think I might need to complete the entire project. What made me think I could do this? I have never been so happy to go to the mailbox to find that my yarn hasn’t arrived yet. I am dreading the day it shows up. Knitters and crocheters who are interested in knitting / crocheting baby sweaters need to know that there is no one set standard that everyone in the industry uses. 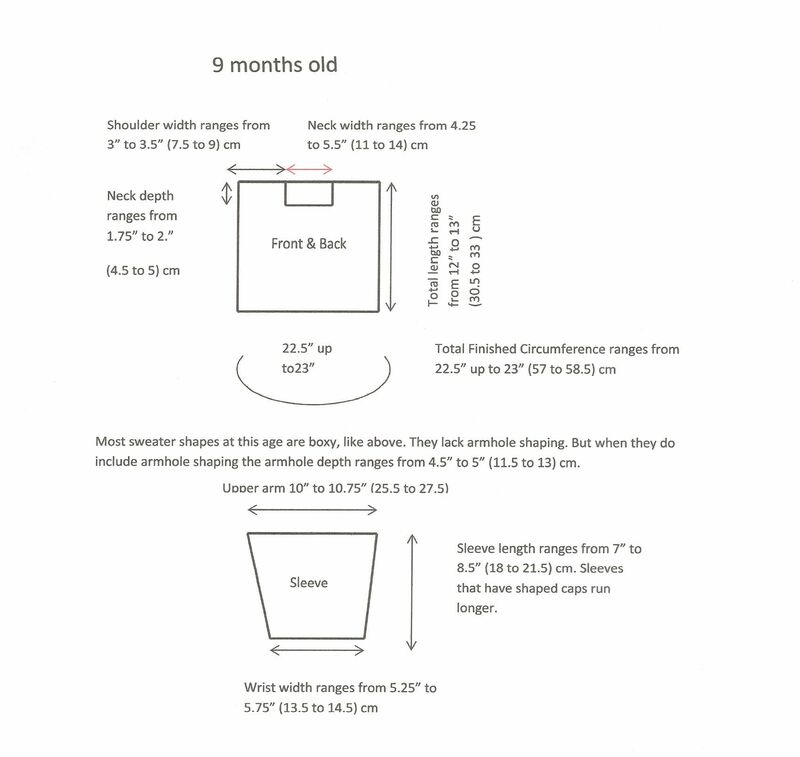 A uniform sizing standard for knitted / crocheted baby clothes that is followed by knitting / crochet magazines, knitting / crochet book publishers, designers, and publishers of knitting / crochet leaflets does not exist. Each magazine, book publisher, leaflet publisher, designer, has its own in-house set of sizing numbers and they don’t agree from one to another. Some say a 3 month old baby’s chest size is 16 inches (40.5) cm. Others say it is 17 inches (43) cm. Still others say it is 18 inches (46) cm. So where do designers and publishers get their numbers from? A variety of sources: the British Standards Institution, for one, and which was last updated in 1982, Yarn Standards and Guidelines is another, The National Bureau of Standards Body Measurements, and ASTM Standards. By the way, one of the latter two was last updated in 1930. Somehow I don’t think body measurements taken during a Depression when there was little affordable food available qualifies to be called a standard. None of the standards found in any of these places agree on measurements. This is why a 3 month old baby has a chest size somewhere between 16 and 18 inches. Some designers and publishers tend to favor the larger numbers in a size range. That means they begin with the assumption that the baby is on the bigger side of things and will design their garments accordingly. 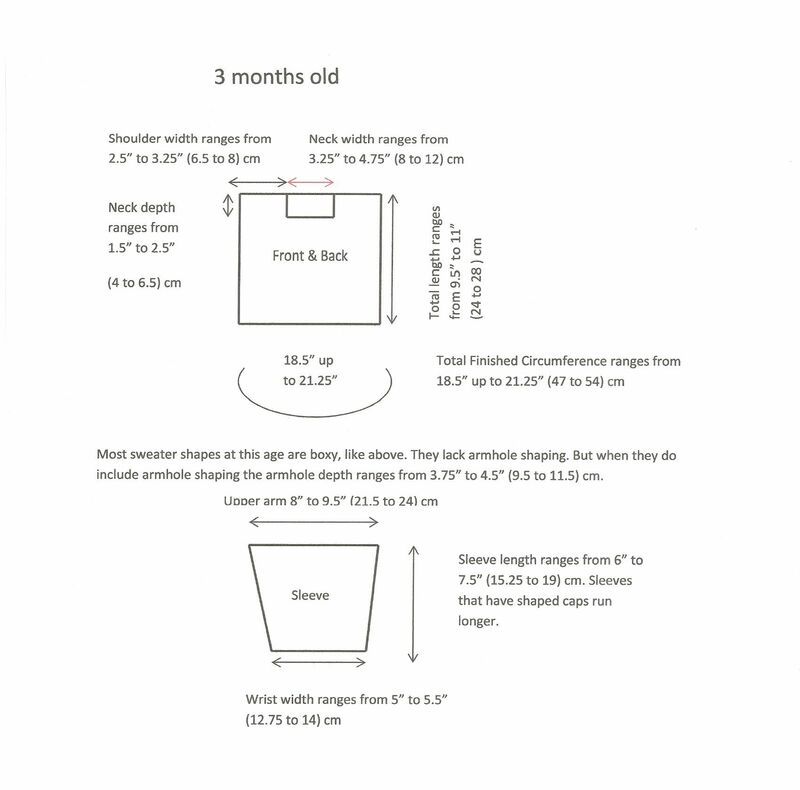 Some tend to size their garments smaller, starting with the assumption that the baby is on the smaller end of the size range. What this does to the knitter / crocheter is drive him / her nuts. In order to prevent this, I suggest you look at the schematics of the project before you begin. If they aren’t readily available look at the numbers the designer provides regarding Finished Chest Circumference. Decide whether these figures agree with what you think will fit the baby you are knitting / crocheting for. The important point here is that you, as the knitter / crocheter, need to have some idea of what an acceptable size range is for you. For that, you need to do some homework and research baby sizes. Don’t panic. I know everybody has enough to do. 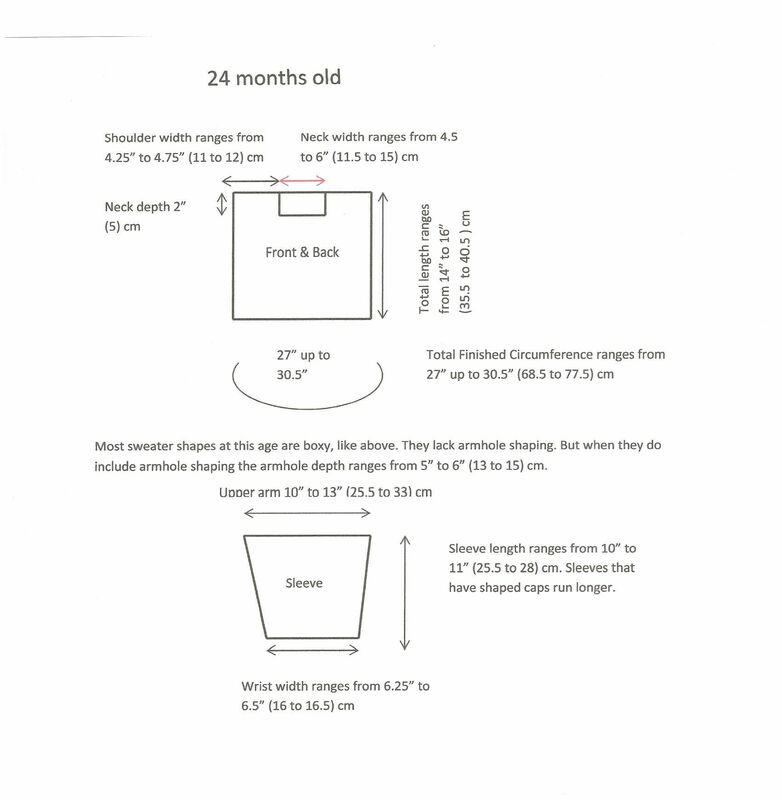 I made up 5 schematics for babies from 3 months to 24 months old. 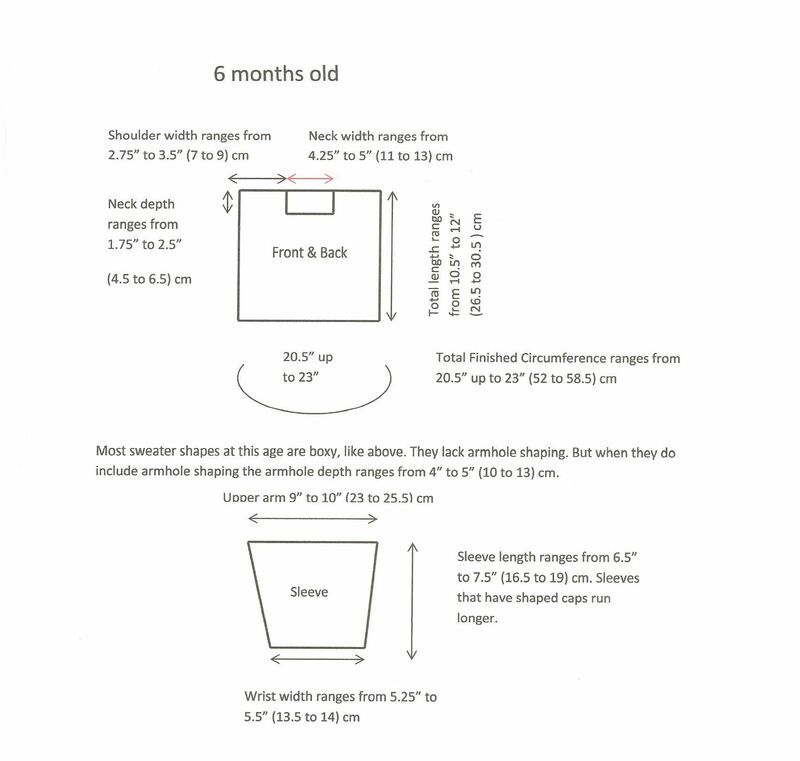 Each schematic shows the variations in measurements that a knitter / crochet might find for that age. Click on the schematic to make it bigger. Print it out if you like. Use them to get an idea of the measurements you feel best fit the babies you knit / crochet for. Don’t expect that you won’t find sweater designs that are outside the range I’ve given. You probably will. But if you know what measurements you feel most comfortable with, you can then chose projects that don’t give you anxiety attacks. I hope you find the schematics helpful. They are for the basic boxy sweater and I will explain more of why boxy sweaters are the dominate shape for baby sweaters in Wednesday’s post along with other things knitters and crocheters need to know before you pick up that pattern and are disappointed.